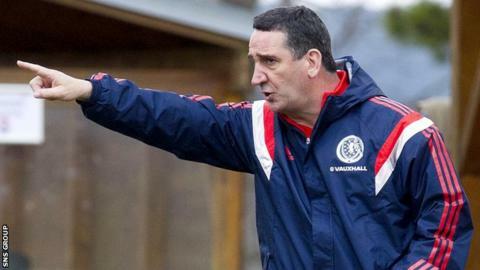 Ricky Sbragia has been appointed Scotland Under-21 head coach, moving up from his previous role in charge of the Under-19s. The former Sunderland manager, 59, will be assisted by Donald Park, who stays on in his role as head of coach education at the Scottish FA. Scot Gemmill will coach the Under-19s, having worked with the Under-17s. "The primary responsibility is to prepare players to make that leap to Gordon Strachan's squad," said Sbragia. "But it is also important that we work hard to ensure we are ready to make an impact in the forthcoming European Championship qualifiers which start in September." Scotland open their campaign away to Northern Ireland before hosting France and Iceland at Pittodrie in a home double-header in October. Ukraine and Macedonia are also in Group Three. Billy Stark vacated the Under-21 head coach's position in November 2014 after six years, with Sbragia and Danny Lennon, now boss at Alloa, taking turns at looking after the team. Sbragia, who also coached at Manchester United and Bolton, caused a surprise in March when he omitted Real Madrid's Jack Harper from his Under-19 squad. He was widely quoted describing the now Brighton forward as "a luxury player", saying he wanted "a physical side" with "more height and runners". Sbragia and Gemmill will assume responsibility for the Under-17 squad for their upcoming friendly matches against Romania on 25 and 27 August.